ONE GREAT COLLECTION ITEM ! With a special thanks to Glasvegas and also "their" Geraldine i've got to give away this vinyl, a special coloured edition and numbered signed by all the band. How i'm gonna do it it's still to be known. I hope it'll be through a specialized magazine or equivalent. Until then, it's here for you to see. Please ignore the date on the first pic and sorry for the resolution on the second. King_leer (KL) : I believe this is the first time you've worked with Kings of Leon. How this union was possible? Through the producers or the band? Richard Dodd (RD): Through the Producers. (KL) : Usually i make some "down to earth" questions to allow readers/viewers to fully understand the specialist work. So, in your own words, what is mastering and what are the most important steps in this process? Do you have a funny story to tell us regarding this particular record. Was the band close to your work or was the producer that conduct the process? 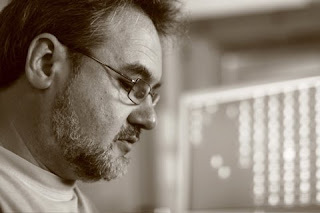 Richard Dodd (RD): After the record is fully recorded and mixed, a Mastering Engineer is called upon to sequence and balance the overall tone and volume of the record. During Mastering last minute tweaks to fades, song edits and punch can be adjusted. Mastering KOL was a pleasure as everyone involved had a vision and stuck to it. By that I mean at no time did anyone, other than me, if I remember correctly, consider attempting to compare or turn the project 'inside out' at this late stage. I presented options, they accepted some and rejected most. After the Producers were happy, the Band (who had been consulted throughout), made some fine adjustments to sequence and spaces. (KL) : What were the differences you found in working with KOL ? They're major assets so, what are the issues they still have to work hard to improve? For me it's their best album 'till date. Richard Dodd (RD): This was my first opportunity to work with KOL. Some Artists stand out. I found KOL to be confident, talented and fun to be around. I'm not surprised that this record is so liked. (KL) : A tricky question. Do you recommend listening KOL on cd or Vinyl? Richard Dodd (RD): Both, they each offer a different set of experiences. The CD offers convenience, durability, capacity and the absence of spurious noises. The Vinyl adds a little 'mystery' and "connection', I find Vinyl to be more compelling to listen too, that is until is mechanical shortcomings overpower the audio. (KL) : Thanks a lot and all the best to you! Well, one more episode from this "Saga", this time from a man that is used to work with great names in his career as you can check in his website bellow. Keep tuned because next chapter will be with the great Angelo Petraglia, producer. GERALDINE, THE STORY, THE MESSAGE...! HI, I'M GERALDINE, THE SOCIAL WORKER !